Faith leaders from across north Staffordshire are to take part in a march as a show of unity following an arson attack on a mosque. Five people have been arrested after a gas pipe was ignited at the building that is still being built in Hanley, Stoke-on-Trent. Detectives believe the incident on 3 December was racially motivated. 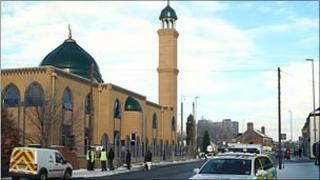 Different religious groups will walk from the Muslim Welfare and Community centre to the new mosque. Two men, aged 18 and 19, and an 18-year-old woman remain on police bail while two other men, aged aged 22 and 28, were arrested on Thursday. Officers were called to the mosque at 0630 GMT on 3 December after live CCTV footage showed smoke emerging from the building. They said a gas pipe had been fed from a nearby building through a window at the mosque.